Unless you’ve already been down the path of buying a wedding or commitment ring, you’re probably under the impression that there’s not much to it, right? I mean, it’s just a simple ring isn’t it? How hard can it be? Truth is, for some people it is really simple. But for many, a whole lot more thought and effort goes into the design and making of the perfect wedding/commitment ring. So much in fact, that we’ve written a whole guide to the process. Not convinced there’s that much to it? Below you’ll find an extract from our Ethical Wedding & Commitment Ring Buyer’s Guide. It’s the first one of seven important design considerations – all about the how much it’s going to cost. Consideration #1 – What’s your budget? The ring you wear on your wedding finger is something you’ll probably wear for the rest of your life. You might even hand it down to your children or your children’s children. We think it’s worthwhile taking this into account when working out your budget. 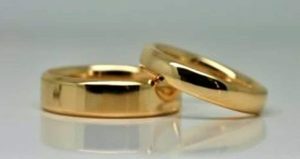 Of course, for some people a wedding or commitment ring is purely functional, little more than a way to communicate they’re in a committed relationship. Others want their ring to be more than that. Not just a symbol, but also a thing of beauty they’re proud to wear – perhaps even meant to complement or even complete an engagement ring design. Either way, you’ll want your ring to be comfortable and durable. It should be able to withstand the rigors of everyday wear. As you are about to see, these considerations (and a lot of other things) influence cost. Many of our customers embellish their rings with precious stones and diamonds, but let’s start with relatively simple metal-only rings. Finishing – in particular textured finishes (like wire-brushing and hammer finishes) and engraving add to the overall cost. So, all that said, let’s see if we can give you a guideline. Bearing in mind metal prices change with movement in the exchange rate and international markets. The example style we’ve chosen is the very popular flat profile with rounded edges – just like the matching pair of 18 carat recycled yellow gold weddings pictured here. All of our rings are made by hand, so we don’t have ready access to pricing for pre-made rings, but the following table will give you an idea of how much prices can vary just for a simple ring. How much is that wedding ring? Engraving is a popular way to add an individual touch to a ring. Words and numbers are usually priced at a rate of around $3.50 per letter/numeral. When it comes to engraving patterns however, the cost depends entirely on the complexity and coverage of the design. You could spend as little as $35 or upwards of $450 for something intricate. ‘Fitted rings’ are those made to wrap around a design feature on another ring worn with it (usually an engagement ring). They can be relatively simple to create, or it can be a big challenge depending on the design of the engagement ring and the wedder itself. Either way, it’s going to be handmade. 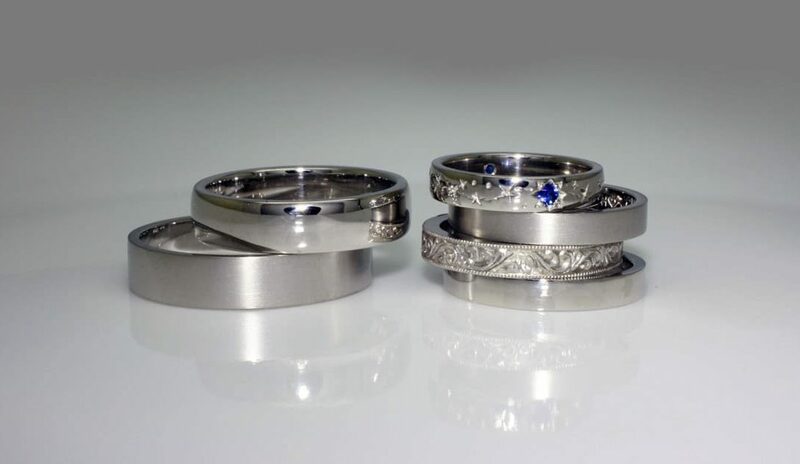 As you can see, fitted wedding rings can take many different forms and pricing can vary from hundreds to thousands. It’s best to have a chat with us so we can give you a quote. It’s very common for us to make wedding rings that include diamonds and gemstones to match the design of the wearer’s engagement ring. But it’s also common for us to make rings like this that are worn on their own. Some people will choose to design a ring that works as both their engagement and wedding ring. Here are some examples of gem-set rings often worn with an engagement ring or as commitment rings on their own. Usually the stones set into a commitment or wedding-style ring are smaller than the central feature stone in an engagement ring. That said, you can still spend a lot if you go for high quality diamonds or rare, very precious coloured gemstones. 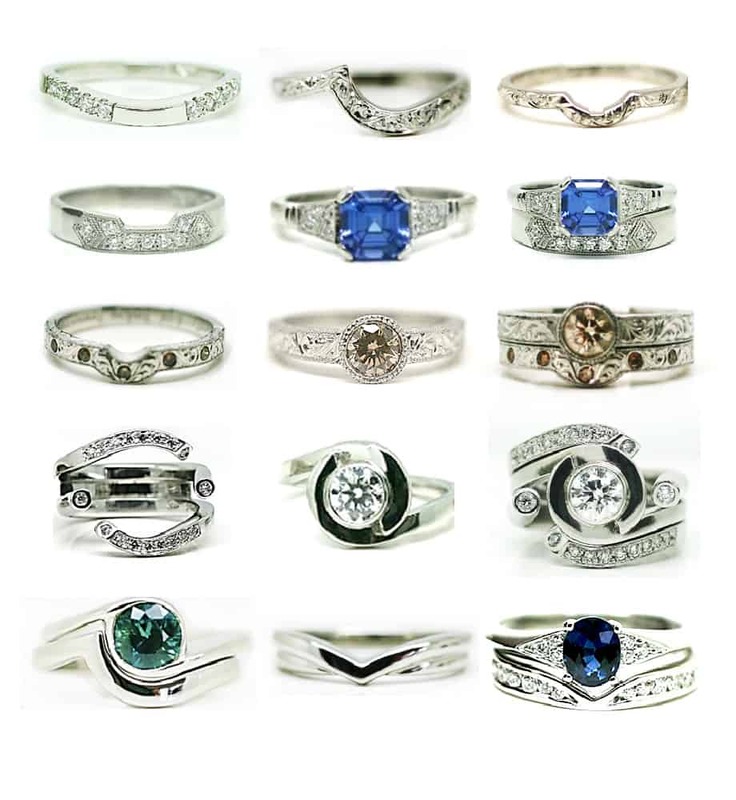 Rings from the top row of the above example start at $1,100. Rings in the second row are more like $2,000-$3,000 (in a half eternity style). For a full eternity band with diamonds up to 2.5mm each (diamonds all the way around), expect to pay $4,000 to $8,000. Spending $8,000+ on this type of ring will probably mean you’ve invested in a relatively large number of very good quality diamonds or a very small number of pink diamonds or another type of rare and expensive gem. *Prices are correct at the time of writing (late 2018). In terms of budget, you could spend $1000 – $2000 for something with a small diamond of a few small gemstones and a bit of engraving like the ones shown on the top row above. Something with a largish central diamond would start at $4,000. A multi-diamond ring like the Celtic example above is completely handmade and involves a lot of labour, metal and diamonds. Something like that you could expect to pay from $7,000.